Do you ever get the urge to do something you know just isn’t good for you? You know, like going out for drinks at a happy hour that turns to late night drinks when you have to get up early for work the next morning. Or lounging on your couch all day watching movies when you should probably be outside doing some sort of exercise. Yeah, I think baking these sticky buns fits the bill too. But hot damn, these were tasty! 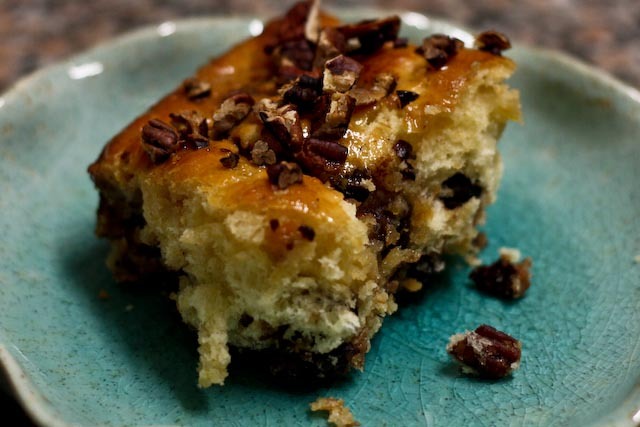 I was first tantalized by these sticky buns when they graced the cover of the April issue of Bon Appetit. The second I pulled the magazine from my mailbox, I was drooling. I figured brunch after Easter mass would be an excellent excuse – er opportunity – to take the recipe for sweet dough for a spin. The basic sweet dough used in this recipe, while quite the technical process, was surprisingly easy to prepare. I was even able to do it without a stand mixer (I used a hand mixer along with a spatula and some elbow grease for kneading). My dough actually came out a bit sticky (my guess is that’s partly due to the high humidity and warmer outside temperatures here), so I had to be very liberal with the flour in order to work the dough. I prepared the buns last night and kept them covered with plastic wrap in the fridge over night. I allowed them to rise for a little over an hour before baking them this morning. The buns are nice and plump as they’ve had time to rise. I brushed them with a little egg wash before baking. They puffed up substantially in the oven (so much so I had to cut them apart). 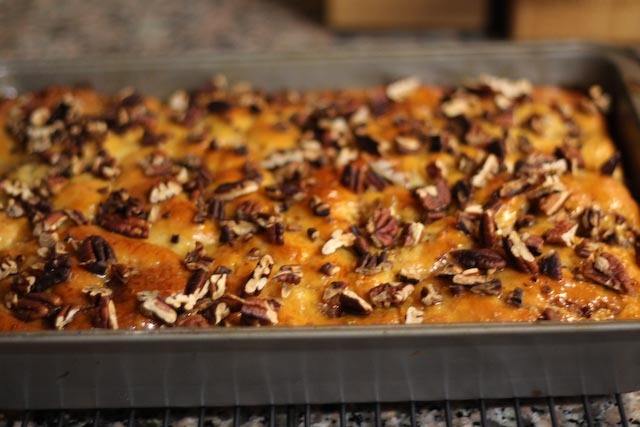 I poured more glaze over top after pulling them from the oven and then sprinkled additional toasted pecans on top. A delicious Easter Sunday treat! Heat the milk in a small saucepan over medium heat or in a microwave until an instant-read thermometer registers 110°-115°F (about 1-2 minutes). Transfer milk to a 2-cup measuring cup and stir in 1 tbsp sugar. Sprinkle the yeast over the milk and whisk to blend. Let sit until the yeast is foamy, about 5 minutes. Add two eggs and whisk until smooth. Combine the remaining 4 tbsp sugar, flour and salt in a medium size bowl. Add the milk mixture and mix on medium speed for 1-2 minutes. With the mixer running, add the butter a few pieces at a time and blend well between additions. 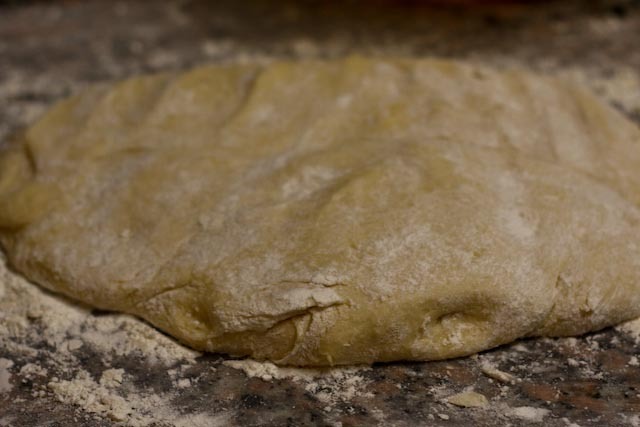 Using a spatula, knead the dough for a few minutes until soft and silky. 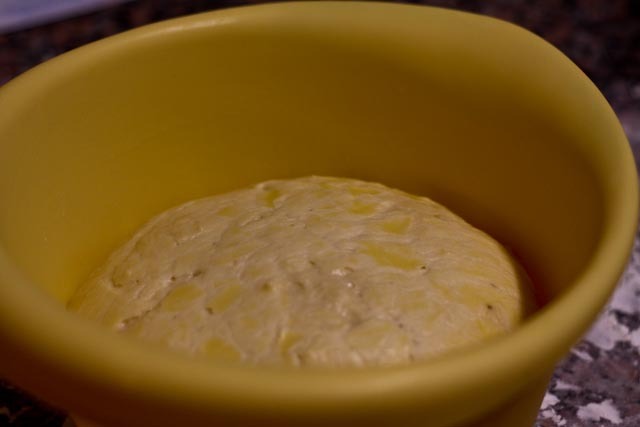 Brush another medium size bowl with melted butter and place the dough in the bowl. Brush the top of the dough with the remaining melted butter and cover with plastic wrap. Chill dough for two hours. Preheat the oven to 350°F. 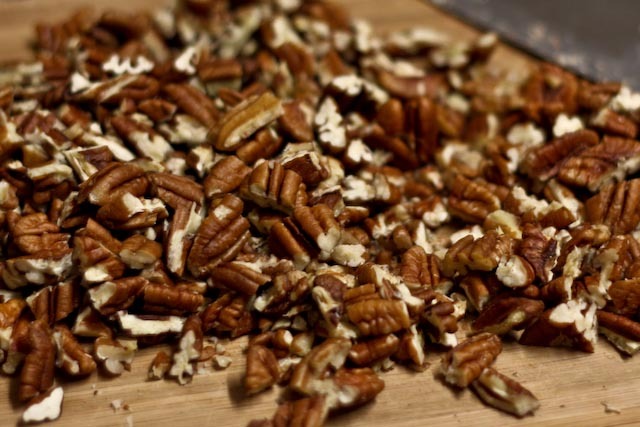 Spread pecans on a baking sheet and toast for 10 minutes or until fragrant and slightly darkened. Let cool completely. Set aside 1 cup pecans for the filling. To make the glaze, melt the butter in a small heavy saucepan over medium heat. Stir in the brown sugar, cream, honey, salt and orange zest. Bring to a boil, then reduce heat to medium and simmer for 3-4 minutes or until glaze is golden brown and glossy. Pour 1 cup of the glaze into the bottom of a rectangular metal baking pan, tilting to coat the bottom and sides of the pan. Set aside the remaining glaze. Sprinkle 1/2 cup toasted pecans over the bottom of the baking pan. To make the filling, beat the butter sugar, cinnamon, nutmeg, and salt in a medium bowl using an electric mixer. Beat until light and fluffy, about 2-3 minutes. Remove the dough from the refrigerator and punch it down with your fists. Transfer the dough to a floured work surface and lightly dust the top with flour. Roll out the dough into a roughly 12″x16″ rectangle about 1/4″ thick with the long side facing you. 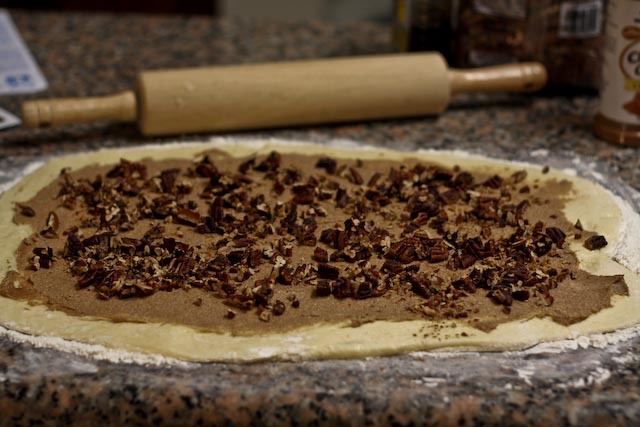 Spread the cinnamon and sugar filling over the dough, leaving a 1″ border on the side farthest from you. 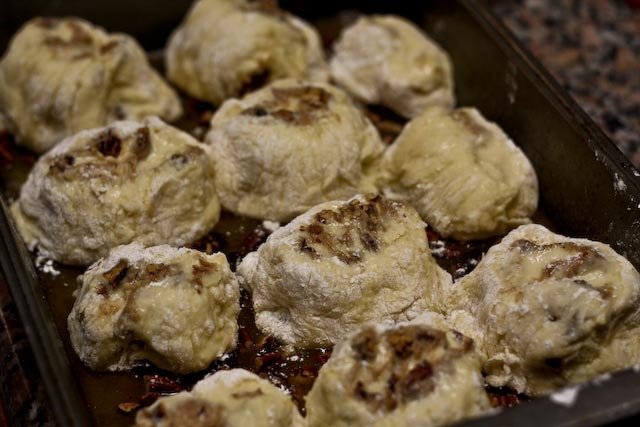 Sprinkle 1 cup chopped pecans over the filling (save the other 1/2 cup pecans for the top of the buns after baking). 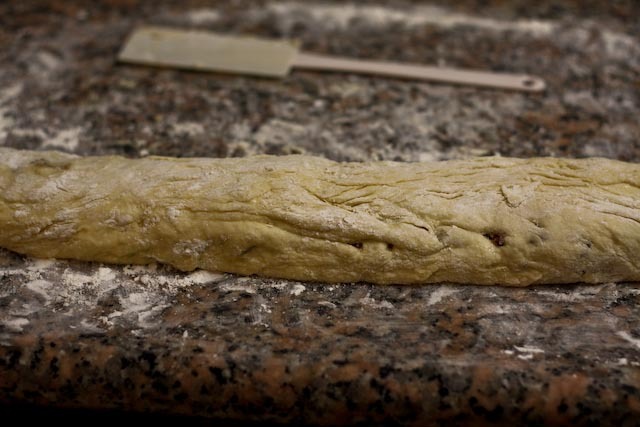 Beginning with the long edge nearest you, roll the dough into a log and pat the ends in if they start to taper. If the dough is too sticky to work with, flour your hands or gently pry the dough from the work surface with a spatula as you roll. Pinch together the seam to seal. Arrange the log seam side down and using a large knife, cut the log crosswise into 10-12 equal pieces. Flour the knife between slices if the dough is too sticky. Turn the buns cut side up and gently pat to reshape and form round edges with lightly floured hands. 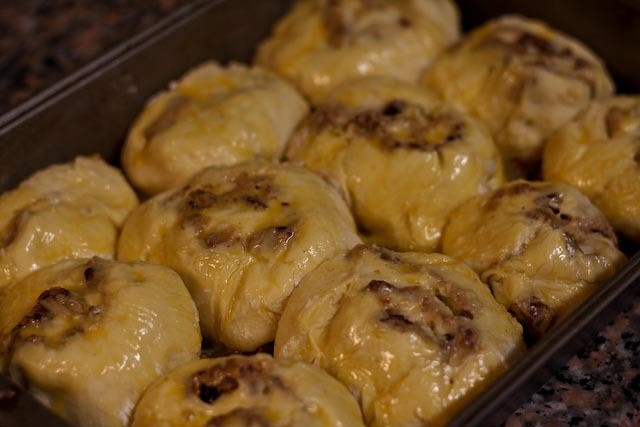 Place the buns in the prepared metal baking dish and space them evenly apart (the buns should not touch). Cover pan with plastic wrap or a dish towel and let rise in a warm, draft-free area until doubled in size about 45 minutes. If you prepare the buns a day ahead and refrigerate overnight, allow buns to rise for 1 1/2 hours (out of the fridge) before baking. Arrange a rack in the middle of the oven and preheat to 350°F. Whisk an egg with 1/2 tsp water in a small bowl and brush the tops of the buns with the egg wash. Tent the pan with foil and bake for 20 minutes. Rotate the pan and remove the foil tent and bake for another 20-25 minutes, until the buns are golden brown, the filling is bubbling and an instant-read thermometer registers 185°F. Let cool for 5 minutes. 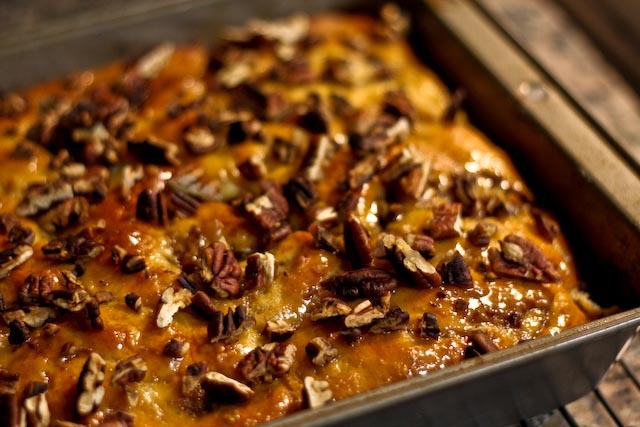 Spoon the remaining glaze over top and sprinkle with 1/2 cup of remaining pecans. Lightly sprinkle with sea salt. Let the pan cool on a wire rack. Serve warm or room temperature. Nutrition Information: In case you haven’t yet noticed, there are three – three! – sticks of butter in this recipe. Just enjoy (one!) and only make these once a year if you can restrain yourself! This page will be linked to a Linky Party at Just A Frugal Foodie. These look so good. We all have to splurge on this kind of food every now and then – life is short! Thanks so much! I love your blog, and congratualtions on all the awards!